Looking for a cute and creative Valentine’s Day gift? 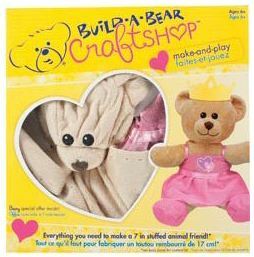 Right now at Kmart, you can get a Build-A-Bear Workshop Kit on sale for only $2.45! You can even use coupon code OFFERS10 to save another 10%. That makes it $2.25 each! These are regularly priced at $12.99 so this is an awesome deal. These bears are smaller than the ones you’d get at the Build-A-Bear store, but they are the official Build-A-Bear brand. My older girls got these for their last birthday and had a blast sewing the bear and putting it together. It does require more sewing that you might expect, the only part actually put together is the bears head.